A Different Mirror 0 Edition Upon its first publication, A Different Mirror was hailed by critics and academics everywhere as a dramatic new retelling of our nation's past. 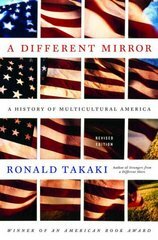 Beginning with the colonization of the New World, it recounted the history of America in the voice of the non-Anglo peoples of the United States--Native Americans, African Americans, Jews, Irish Americans, Asian Americans, Latinos, and others--groups who helped create this country's rich mosaic culture.Now, Ronald Takaki has revised his landmark work and made it even more relevant and important. Among the new additions to the book are:--The role of black soldiers in preserving the Union--The history of Chinese Americans from 1900-1941--An investigation into the hot-button issue of "illegal" immigrants from Mexico--A look at the sudden visibility of Muslim refugees from Afghanistan.This new edition of A Different Mirror is a remarkable achievement that grapples with the raw truth of American history and examines the ultimate question of what it means to be an American.